TORONTO — Playing through the pressure, and exploiting pockets of spaces. 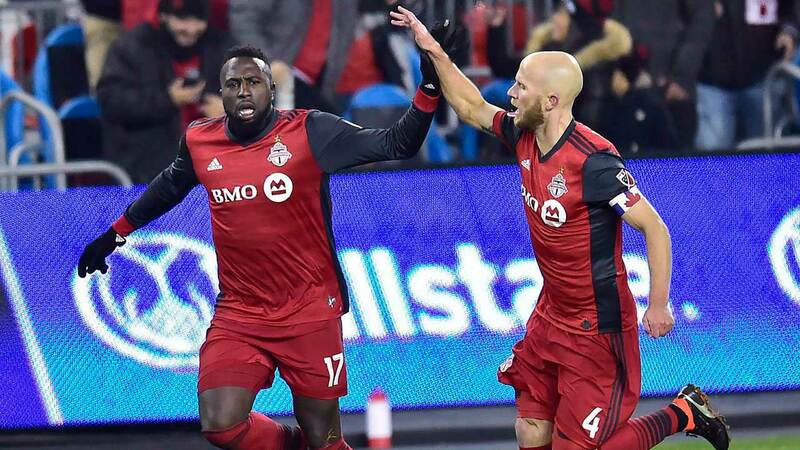 Success could come down to those two key tactical points for Toronto FC when it hosts Mexican team Club America in the first leg of the CONCACAF Champions League semifinals on Tuesday night. Club America is an aggressive side that routinely uses its front five or six attacking players to put pressure on the ball in an attempt to force their opponents into making turnovers and shorten up the field. But, as TFC coach Greg Vanney pointed out, if you can overcome that pressure, then there tends to be a lot of space between Club America’s attackers and its defenders. The key to exploiting that space for Toronto is being smart on the counterattack. There’s no need to rush it and be overly aggressive, Vanney said. You have to pick your moments. “In transition, the first thing is can we get beyond that pressure, so that we’re not trying to play and break down 10 [opposing players] every single time we have the ball,” Vanney explained. Club America is a stingy team — they’ve conceded just 10 goals in 13 Mexican league matches this season. But they are by no means a defensive side. They don’t sit back. Instead, they try to force the issue, and that’s what Vanney expects they’ll do on Tuesday. “My anticipation is they’ll come and they’ll try to play and they’ll try to still create turnovers in advantageous positions and try to play on the transition. They’ll still look for their moments to really try to be aggressive,” TFC’s coach stated. Under Vanney, TFC has been transformed over the last two years into a team that focuses on quick and efficient ball movement. He doesn’t want players dawdling in possession — take one or two touches, and move the ball along to the next person. The Reds can’t stray from that philosophy on Tuesday. Based in Mexico City, Club America is one of the biggest and most successful clubs in Mexico, and is regarded as one best sides in the entire CONCACAF region. Nicknamed Las Aguilas (The Eagles), Club America’s current roster boasts international players and a number of Mexican national team members. Mexican forward Henry Martin and Paraguayan winger Cecilio Dominguez lead this year’s Champions League in scoring with three goals apiece. Club America has won the Mexican league title a record 12 times (tied with Club Deportivo Guadalajara). It has also won a pair of CONCACAF Champions League titles (2015 and 2016), and it won the CONCACAF Champions’ Cup (the forerunner to the Champions League) on five occasions. Club America currently sits fourth in Mexico’s Liga MX standings, and is coming off of a 3-1 home win over Cruz Azul on Saturday. Vanney confirmed Monday that defender Nick Hagglund has been ruled out for the next six weeks with a serious hamstring strain. Hagglund, 25, suffered the injury late last week on the practice field. “It’s a reasonably significant hamstring strain,” Vanney said of Hagglund. Hagglund has made one appearance in MLS this season. He also played in all four Champions League games to this point, making two starts against the Colorado Rapids in the round of 16. The native of Cincinnati missed most of the 2017 MLS season due to knee injuries. Vanney is taking a wait and see approach on three injured starters — defender Chris Mavinga (lower body), full-back Justin Morrow (calf) and midfielder Victor Vazquez (back) — ahead of the first leg vs. Club America. All three completed Monday’s training session, but Vanney said he’ll see how they progress over the next 24 hours before deciding on whether they can play Tuesday. Vazquez has been troubled by his back since being subbed out of Toronto’s season-opening loss to Columbus on March 3. Mavinga and Morrow picked up their injuries in the second leg of TFC’s CONCACAF Champions League quarterfinal against Tigres on March 7. TFC has a bye this week in MLS. It was originally scheduled to host D.C. United on Saturday, but the league rescheduled the game for June 13 so the Reds can concentrate on the return match against Club America. The second leg of the Champions League semifinal is scheduled for April 10 at Mexico City’s Estadio Azteca. Vanney told Sportsnet that the team plans to fly down to Mexico on Thursday so that it can spend a few days there to acclimate to the conditions. The winner of this series advances to the final where they will take on the winner of the other semifinal between the New York Red Bulls and Mexican side Club Deportivo Guadalajara.